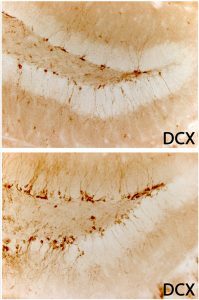 Neurogenesis is increased during acute and chronic neurodegeneration, with the potential to replace damaged neurons at the sites of neuronal loss. These findings support the need for a better understanding of injury-induced neurogenesis in the adult brain undergoing chronic neurodegeneration and suggest the potential of neural precursor regulation as a strategy for brain repair. Our results describe for the first time the regulation of neurogenesis during prion disease. We observed that the production of new neurons in the dentate gyrus is increased in prion diseased mice (right, bottom), compared to controls (right, top). More interestingly, this process is regulated by factors produced by microglia, suggesting that inflammation can control adult neurogenesis in chronic neurodegeneration. 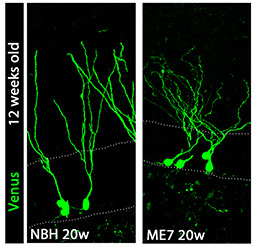 This results open a window for the full understanding of the regulation and role of neurogenesis during progressive neurodegenerative disease. 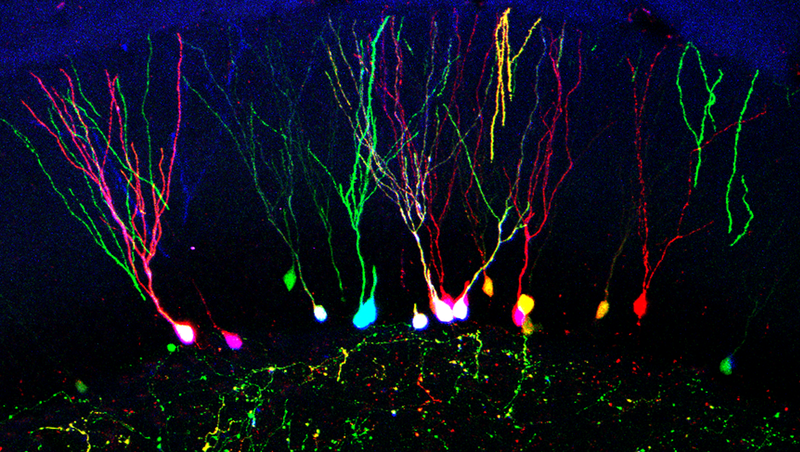 Retroviral tracing of newborn neurons generated in the Dentate Gyrus of control mice (left) and prion-diseased mice (right), showing deficient maturation in diseased mice.